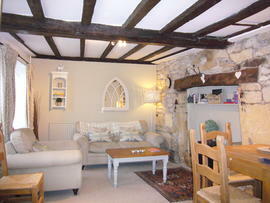 This holiday cottage near Bath has definite WOW factor! Kick off your shoes and relax, unwind - this is your perfect holiday retreat for Bath, The Cotswolds, Longleat and beyond! 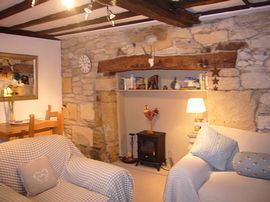 Romantic Kemble Cottage near Bath, is a characterful self catering beamed holiday cottage providing just the escape you need, just 7 miles from Bath, in the picturesque town of Bradford on Avon and ideal for visiting Cotswolds, Longleat, Stonehenge, Salisbury, Cheddar Caves, Wells and Bristol. 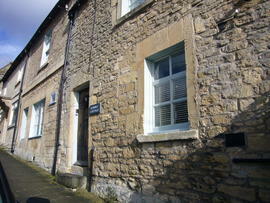 There are numerous National Trust properties nearby and the villages of Castle Combe and Lacock. Canal and river walks, horseriding, cycling, golf and fishing locally. With two bedrooms, the cottage simply oozes style and offers you a wonderful escape at any time of the year - Christmas and New Year are favourite times of the year. 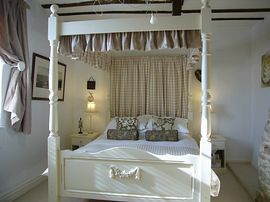 King four poster bed in the main bedroom and wrought iron single bed in the second bedroom, it is ideal for 3 people and we can provide a cot for a baby. The kitchen is fully equipped and has a washing machine. There are plenty of utensils and cookware for your needs, but we hope you won’t need to cook too much, with the numerous eateries on your doorstep! A welcome pack provides some food essentials, plus an inititial supply of washing up liquid and disposable dish cloths are also provided. 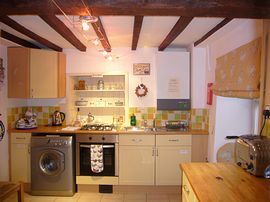 A perfect self catering holiday cottage or vacation rental near Bath and Longleat the Cotswolds, Stonehenge, Avebury, Lacock, Castle Combe, Salisbury, Wells, Cheddar and Wookey Hole. SHORT BREAKS: We only offer short breaks as late availability, minimum 3 night charge from £85 - £99 per night. Near Bath, Longleat and the Cotswolds. On street parking, walk to shops and restaurants. Not suitable for disabled guests - not accessible for wheelchairs. Regrettably, we are unable to accept pets. No smoking in any area of the cottage. There is no garden...but you can walk to the shops and cafes plus beautiful canal and river walks nearby.Hire bikes locally, too! Local Services: Bus service to Bath every 30 minutes. Regular trains to Bath (12 minutes) and London (90 minutes). Take A46 and continue in direction of Bath/Chippenham. Follow signs A363 Bradford on Avon and continue 4 miles. On entering 40 then 30 mile speed limits, across first mini roundabout then left at next roundabout (Castle Inn) into Mount Pleasant. Take next right the cottage will be found on the left hand side. Park outside. Regular trains London Waterloo. Services from Paddington connect at Bath. Short breaks available within 4 weeks of dates £99 per night (minimum 3 nights). Please enquire. Open throughout the year - including Christmas and New Year.